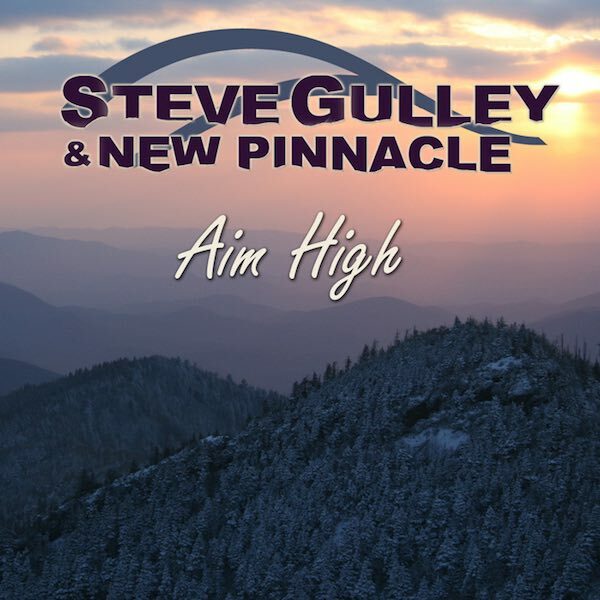 Rural Rhythm Records had announced the release of “Aim High”, the new album by Steve Gulley & New Pinnacle. The album is available from the 8th July. Steve Gulley & New Pinnacle have been busy since the launch of their self-titled debut album a little more than a year ago. The group received standing ovations for both their IBMA and SPBGMA Official Showcase performances and has charted 5 songs from their debut album with several songs still on the charts. “Aim High” is their highly anticipated follow-up album and contains the #1 single “Aim High” from Bluegrass Today’s Weekly Airplay Chart. Steve Gulley & New Pinnacle is no stranger to the #1 position on Bluegrass Today’s Weekly Airplay Chart with “Leaving Crazytown” from their debut album going #1 six times. “Aim High” features three Gulley co-written songs including two with his award-winning co-songwriter Tim Stafford; “Deceitful Kind”, “Love Brings You Home” and “Short Life Full Of Trouble” co-written with Larry Shell and Kim Williams. In addition, Carl Jackson co-wrote three songs for the new album, in addition to great songwriters such as Larry Cordle, Jim Rushing, Sonya Isaacs, Becky Buller, Keith Sewell and more. With the success of our debut project, the guys and I knew the expectations would be even higher for our sophomore recording. With that in mind, we went about the business of writing and finding the very best songs we could with an even stronger intensity. We hand-picked songs from within the band and from some of the greatest songwriters our music has to offer. That being said, I couldn’t be happier with the new music we’ve created on “Aim High”. I am so proud of our debut album and see it as laying the foundation for our music and sound but, as is always the case, once you have a strong foundation; it’s time to start building on that. I really feel like we’ve done that with the new recording, while staying true to our band’s original sound. I’m so excited to share this, the next chapter, with everyone – Steve Gulley. Steve Gulley & New Pinnacle includes Steve Gulley on guitar, Bryan Turner on bass, Gary Robinson, Jr. on mandolin, Matthew Cruby on banjo and special guest Tim Crouch on fiddle. “Aim High” builds on the band’s family heritage of strong roots in Bluegrass and Mountain Gospel and at the same time provides a new and fresh sound that further accents the Steve Gulley and New Pinnacle sound. D.J.’s can now download “Aim High” on AirPlay Direct and CD promos now arriving at Bluegrass radio stations. In addition, the album is available now for pre-orders on iTunes, Amazon and all other digital and online sources. Steve Gulley & New Pinnacle is now touring the US in support of their debut album. Go to the band’s web site at www.stevegulley.com for a complete listing of tour dates. Steve Gulley & New Pinnacle includes; Steve Gulley (guitar, vocals), Bryan Turner (bass, vocals), Gary Robinson, Jr. (mandolin) and Matthew Cruby (banjo, vocals). Steve Gulley certainly does not need any introduction to the Bluegrass community with accomplishments that include 16 years as a featured performer, staff musician, music director, studio manager and producer at Renfro Valley, KY. From 1994-96 Steve was a member of Doyle Lawson & Quicksilver and a founding member of Mountain Heart (’98 – ’06), Grasstowne (’06 – ’11) and with longtime friend Dale Ann Bradley through 2014. Steve is a winner of 4 IBMA Awards including Co-writer of the 2008 Song Of The Year, “Through The Window Of A Train”, by Blue Highway and SPBGMA Multi award winner including 2008 Album Of The Year, “The Road Headin’ Home”, by Grasstowne.